With all the flavours of a fry-up in one, this cake can be made the day before and heated through in the oven at 150°C, gas mark 2 for 10-15 minutes. Preheat the oven to 180°C, gas mark 4. Place the tomatoes in a roasting tin, cut side up. Drizzle with oil and sprinkle with the sugar, thyme or oregano and season. Set aside. To make the cake, grease a 900g loaf tin and line with baking parchment. Place the potatoes in a pan, cover with cold water and bring to the boil. Simmer for 10-15 minutes until tender. Drain and allow to cool slightly, then grate coarsely. Meanwhile, place the spinach in a pan, splash with a little water and cook over a medium heat for 1-2 minutes, or until just wilted (alternatively, microwave in the bag; follow the instructions on the pack.) Drain and cool in a colander, then squeeze out any excess liquid and chop roughly. Crush the bacon into a bowl and mix in the spinach, potato, Parmigiano-Reggiano, ricotta and eggs. Season with pepper. Tip the mixture into the loaf tin. Cook for 25 minutes. Place the tomatoes on a lower oven shelf, beneath the cake, and continue to cook for about 10-15 minutes until the cake is just firm to the touch and the tomatoes are cooked. Leave the cake to cool slightly in the tin, then turn out while still warm. 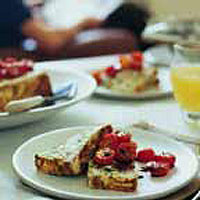 Drizzle the tomatoes with balsamic vinegar and serve with slices of warm cake. To cook your own bacon, dry fry a 190g pack Waitrose British Smoked Rindless Streaky Bacon in a large pan for 5-10 minutes until crispy, then chop finely and use as above.